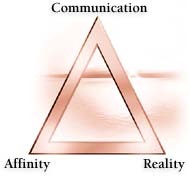 In Scientology we have a magic triangleonly we dont call it a magic triangle. It is just called ARC. Life has three component parts: affinity, reality and communication. These form a triangleA-R-C. They are interdependent to such a degree that if you interrupt any one of them, you will interrupt the flow of the other two. Let us examine the component parts of this triangle.